Suppose that when Marcellus besieged Syracuse, Archimedes was standing at a corner of the city wall. A ditch runs parallel to the wall, separated from it by a distance a. To Archimedes’ left at distance b along the wall stands a catapult, which is distance c from a line perpendicular to the ditch. If Archimedes’ line of sight to the camp runs perpendicular to the wall and the ditch, show that he stood a distance ab/c from the camp. 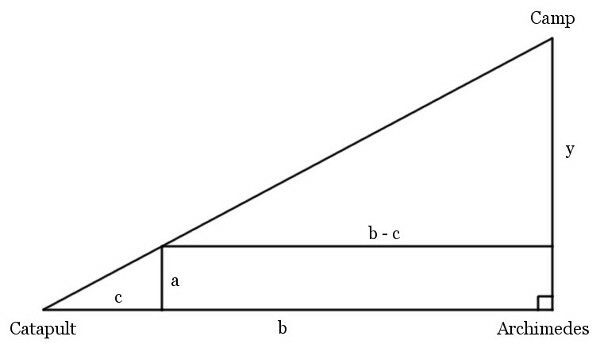 In the diagram, (y + a)/b = a/c, so multiplying both sides by b we get y + a = ab/c.